Andrew, we know that you hold a Law Degree and Master’s Degree from Drexel University and that you are an expert in cryptocurrency and blockchain regulation. Can you tell us more about your background? Where do you come from and where do you live? I grew up in the suburbs of Philadelphia, Pennsylvania. After high school, I obtained a Bachelor’s Degree in Political Science from Goucher College in Maryland, and Before attending law school, I worked in politics for a candidate who ran for Attorney General of Pennsylvania. Initially, I had political career ambitions, but that was before I found Bitcoin! You mentioned prior to this interview that you found out about Bitcoin in 2011. Can you remember the first thing that popped in your mind then? It was around the time Reddit was becoming more and more popular, and I’ve always been personally interested in emerging technology (my father is an engineer and my sister has a degree in physics). I recall scrolling through a technology subreddit post, and a comment from another user said I should check out this thing called “Bitcoin.” A couple clicks later I found myself on a bitcoin forum and eventually Satoshi’s Whitepaper. The first thing that popped into my head was that a currency used via the internet made a lot of sense. Of course, terms such as blockchain and permission-less protocols were not in the crypto rhetoric yet, so really I was just immediately fascinated by an online currency with no governmental oversight. With the caveat that I had no idea at the time, it would grow to what it is today! What do you see in blockchain? Do you think that blockchain technology can change our lives? I see blockchain as a revolutionary technology changing how we share information in the global economy. The creation of the Internet changed how we share information. However, the verification of that information has always been an issue. Blockchain serves as a potential solution to this problem. Whether its double spending issues, or centralized entities manipulating information, Blockchain serves as a check on not only the information, but the verification process implemented to ensure information is accurate, transparent, and secure. I’m seeing the silos of information within our global economy change almost daily, and Blockchain is at the forefront of this change. I do think Blockchain will impact everyone in the world someday. The industry is extremely nascent, and it will take time for adoption to occur, but we’re already seeing clients and others working in the industry creating blockchain-based applications that impact how we transfer money, track products, protect privacy, etc. One day governments all over the world will use Blockchain in some way shape or form to provide transparency and accuracy of information. As a result, I definitely think Blockchain has the potential to change everyone’s life. Since 2016, you have been the CEO of Titan Ventures, operating a digital asset fund and proprietary crypto mining operation, right? Tell us about Titan Ventures. We actually heard that you closed mining company. Why is that? Correct. I started a propriety mining company, with my business partner Tyler Harttraft, as well as using the mining proceeds as collateral for an investment portfolio for accredited investors. We first began building GPU miners years ago as a hobby, and with the expansion of the number of cryptos and the overall market cap, our business grew into a multi-facility operation with GPUs and ASIC miners. Our miners would mine the most profitable token using an algorithm and convert these smaller market cap tokens into larger market cap ones, e.g.,. Bitcoin and Ether. The portfolio side focused on DApp based application tokens, e.g., the Ether token, and one of the higher level ICOs we participated was the BAT token sale (even though it’s not a DApp). We closed shop on both of these entities back in mid-2018 to focus on legal services. 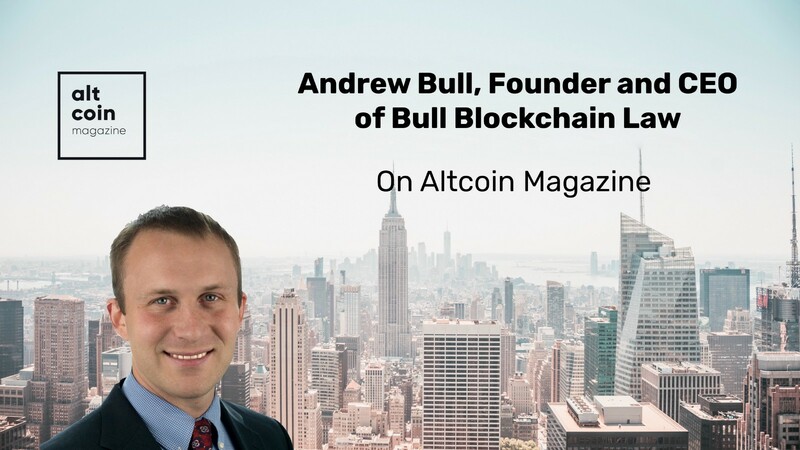 You are also founder and CEO of Bull Blockchain Law LLC focusing on advising clients on how to securely enter the blockchain and crypto space. How did you get an idea to start Philadelphia’s first blockchain and cryptocurrency Law Firm? Having worked on the tech side of the industry, I saw first-hand how there were virtually no attorneys in the space. We handled a lot of our own legal work at Titan Ventures and kept helping others in the space understand what was required from a regulatory perspective. We were lucky enough to have Titan take off at the right time, and then when the regulatory environment became clearer, I decided our technical and legal expertise could solve some of the critiques that a lot of people in the industry had of traditional law firms. What makes you and your co-worker, Tyler Harttraft, good partners? Are there common themes or topics around which you tend to disagree? Our shared experience and sincere interest in technology are what makes us work so well together. It is not often you can have deep discussions with someone else who went through the Mt. Gox crash or knows how to configure an ASIC miner while also having a legal background. Really, just being in the industry for years together creates a strong bond of understanding. With that said, we certainly disagree on aspects in the space. Tyler has a deeper understanding of intellectual property, and I tend to advocate a little too much on the decentralized information sharing side of things. We’ve found this combo really helps when it comes to ensuring our clients are regulatory compliant. You serve on the editorial board for BlockDrop, Inc., a blockchain legal document generation service, as well as on the advisory board for several blockchain companies including Verif-y, Legicash, and Reel Track. How do you keep up with everything? Do you get any sleep at all? No sleep! I remember one of the first calls I had with the now CEO of BlockDrop, Jeff Knight last year about helping generate the content for BlockDrop, a blockchain focused legal document generation service. We’re so focused on trying to standardize legal documents in the industry that sleep just was not on our radar. But the reality is this industry moves so fast. I attend conferences to speak quite frequently, and I learn something new every time. Whether it’s a new blockchain application or a regulatory body issuing new guidance, keeping up with this rapidly expanding technology certainly is all-encompassing. The great thing is that each day is different. I count myself very lucky to have experienced a lot of it. At 30, you are still very young, what do you want to achieve in your life? My main goal is to build out a law firm that provides services for all industries applying Blockchain. In other words, because we are so early in Blockchain adoption, I envision international level law firms in the future fully focused on the technology. As a result, I’d like to create a firm with an environment that provides quality affordable services to clients without losing sight of why this technology exists. This firm will certainly use blockchain within its own platform for our protected information and client services. Indeed, a multi-level law firm ran similar to a large tech company that has different departments for all areas of blockchain application, e.g., supply chain, healthcare, finance, etc., is my main goal! Don’t lose sight of what brought you to this industry initially, and don’t forget how nascent the industry really is. I’m here today because of a personal passion I had and still have. As things grow, it’s easy to lose sight of that. I spend a lot of time helping others solve the steep educational hurdle for understanding Blockchain, and I have to remind myself that only a small amount of people really understand how the technology functions and what its purpose is. Remembering that is crucial to bring a balanced perspective to those with less experience. What mistakes have you made along the way that others can learn from (or something you would do differently)? One of my early mistakes was thinking I could day trade on crypto exchanges better than others. It worked in the beginning, but as the industry expanded, more sophisticated trading programs were created. Really, there will always be someone else out there who has a better model or strategy for trading. There are so many algorithms, bots, and arbitrage trading regimes that result in a very unruly market. Don’t invest more than what you can afford to lose. Even when token projects seem legit, always remember there are scams and fraudsters trying to take advantage of people. Thinking that one-day Blockchain will be everywhere and benefit everyone in some capacity, and the more people who participate in the industry, the better. Anything else you would like to add before we finish? I appreciate the time and questions, and I’d say that Blockchain does not have application everywhere. There are many examples where it does not apply or it would be inefficient for adoption, but the future will bring new developments in the industry that will help allow for broader application. When I published my thesis on the regulation of cryptos in 2015, only a small amount of tokens existed. Now, look where we are!